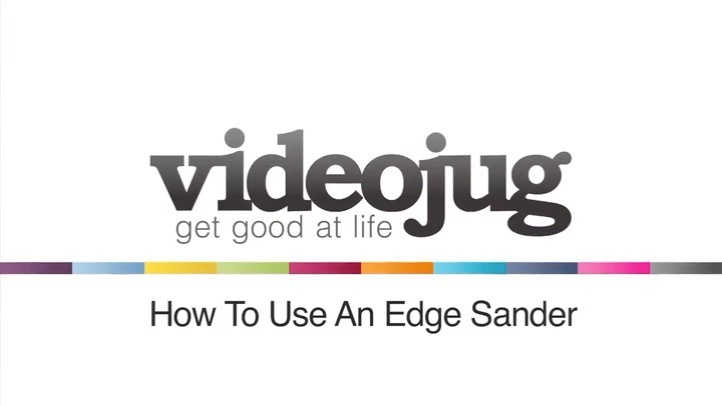 Videojug video demonstrates step-by-step process of how to go about using an edging sander. It shows you how to choose sanding sheets and what their different grading implies. You start off by fitting the sanding paper to bottom of the machine. This video also demonstrates how to the power controls of the machine work and when to empty the paper bag to remove the accumulated dust. Hi, we’re Alexandra Tool Hire. My name is Bob and I’m going to show you some tool tips. In this video, I’m going to show you how to use an edging sander. It’s used when you’re sanding floors and the main floor of sand doesn’t get right up to the edges. So you need about three or four inches where this does the job without ruining your skirting board. First of all, what you have to do is you clean the machine over and make sure it’s not plugged in, of course. And the key for changing it is just underneath. What you do is you loosen the centre nut there and you pick your sanding sheets. The higher the number, the finer the sheet. All sandpaper is a standard and you can tell how coarse it is by the number so this is a 24 grade there, 36 grade there, 80 grade, 120 grade. And we just make sure that it goes through the centre. You tighten that up and make sure that you tighten it up fully and that takes the washer down below the sanding sheet. Otherwise the washer will scrape the floor. We’re almost ready to go. So what we do is we just take this off, and then we lower it down the cage, and we put the dust bag on, because this picks up 95% of the dust. And it simply just push it on. Just push it on like that and the cage supports it. So when it gets filled up with saw dust, it doesn’t scrape on the floor. And what you’ve got is you’ve got a button on the top and what you do is you press it down, and as soon as you let it go, the machine stops. But what you do is you take it right up to the edge of the skirting board and that revolves separately to the sanding disk. When the bag gets less, less than the half full, take it outside, take it off, empty it or change the bag over. You must finish off with a fine sanding paper, otherwise you start getting marks in the floor. And that’s simple. It’s how you use a floor sander.